Lexington&apos;s Gideon Fiefke reacts after winning a game against BC High during a state semifinal. Bisazza helped lead Barnstable to the Division 1 South Sectional finals before falling to BC High. Individually he reached the South Sectional semifinals. An honors student, he competes in USTA events all year long and hopes to play Division 1 tennis. Chapman, along with classmate Jack Mykrantz, captured the South Sectional doubles title this spring. He also helped lead Wellesley to a 17-2 season, and earned first-team Bay State League honors for the second straight year. He will attend NYU. Chen finished the season with a 21-2 record and a 63-6 career mark, reaching the North Sectional finals individually. His efforts helped lift Weston to the Division 3 state team title and earned him DCL All-Star honors for the third time. Chin closed out his career in style, earning the North Sectional doubles title with teammate Gideon Feifke. The tandem also helped lead Lexington to an undefeated season and the Division 1 state title. An honors student, he will attend Babson. Chisolm finished his career with a 17-3 season that saw Xaverian get to the state tournament. He reached the South Sectional individual semifinals as well. He is a two-time Catholic Conference All-Star and three-time team MVP will attend Richmond. Feifke teamed with Connor Chin to win the North Sectional doubles title, while helping Lexington to the Division 1 state title. A two-time Middlesex League All-Star, he competes in USTA events and plays soccer for the Minutemen. Flint capped his high school career with an undefeated season at the No. 1 singles spot. He was named EIL MVP and earned three EIL championships during his time at Beaver Country Day. Flint will attend Washington University in St. Louis. The freshman burst onto the scene with an undefeated regular season. He was the Tri-Valley League MVP and won the North Sectional title. Freeman is currently ranked No. 1 in New England at 14-and-under and competes for the New England Intersectional Team. Goffstein formed a sound partnership with teammate Owen Grafe. The duo helped lead Newton North back into the state tournament and was also a South Sectional finalist individually. Goffstein runs cross-country and will attend the University of Miami. Grafe teamed with Adam Goffstein to play deep into the South Sectional doubles tournament for the second straight year. He is one of the top shot putters in the state, competing for the Tigers during indoor track season. After earning ISL all-star honors last spring, Haig took it a step further, earning ISL MVP honors this spring for the Foxes. Roxbury Latin went 15-2 and captured its fourth straight ISL title. Haig, the team captain, finished 28-2 at No. 1 singles. Maffa was 16-0 on the season, including his 14-0 partnership with Daniel Seong. Their efforts helped Lexington to the Middlesex League, North Sectional, and state titles this season. 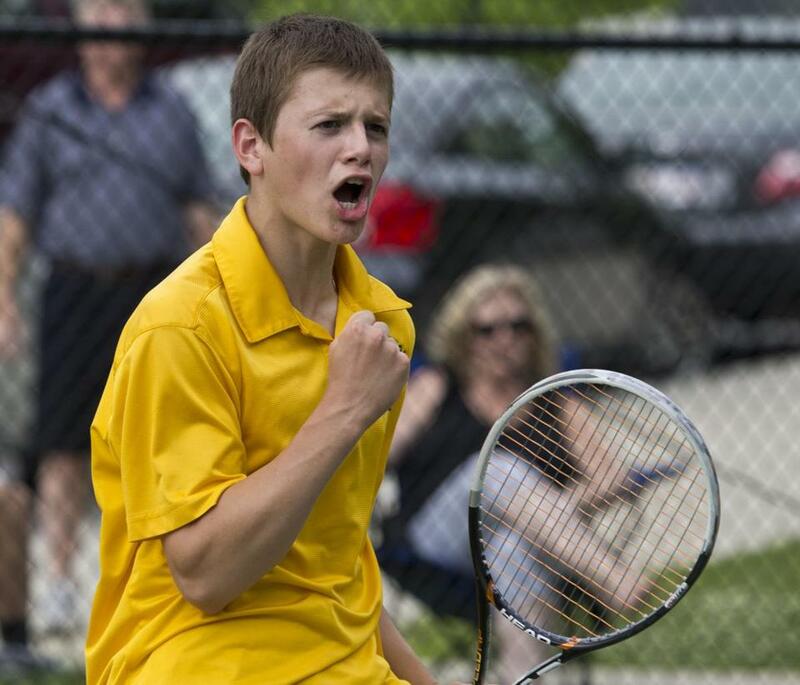 The Middlesex League All-Star plays tennis year round. Melampy closed out his senior season with a spot in the South Sectional finals. His efforts helped lead the Green Dragons to the South Sectional title for the second straight year. An honors student, he will attend Coast Guard Academy. Mykrantz captained Wellesley to a 17-2 record and a Bay State League title. He teamed with Ethan Chapman to capture the South Sectional doubles title. An honors student, he enjoys basketball and golf in his spare time. A repeat All-Scholastic selection and a two-time MBIL MVP, Oloko is currently ranked 10th in New England. After an undefeated junior year, Oloko proved it was no fluke with another outstanding spring for Boston Trinity. Seong teamed up with Ben Maffa to help lift the Minutemen to the Division 1 North Sectional and state championships. Individually the tandem reached the sectional final. An honors student, he won first place at the Massachusetts Science Fair. Sharton followed in his older brother’s footsteps and helped lead Wayland to an undefeated season and the Division 2 state title. He earned DCL All-Star honors and reached the semifinals of the North Sectional individual tournament. He competes in USTA events. Sharton helped pace Wayland’s undefeated season en route to his second Division 2 state team title. Individually he reached the semifinals of the North Sectionals after reaching the state finals a year ago. He is also an honor roll student. A repeat All-Scholastic, Wyeth captured the Massachusetts championship after winning the South Sectional title. At states, the junior overcame Westboro’s Sumukh Pathi, 6-3, 6-1, ending his junior campaign on a winning note. Allshouse helped lead the Lancers to the program’s first tournament victory. In just three seasons he has taken the team from 1-18 to 12-8, the best record in team history. An Acton-Boxboro and UMass alum, Allshouse also skis. Williams helped lead Melrose to a 9-1 record and a first-place tie in the Middlesex Freedom Division, the first program title since 1941. Williams is a Reading High and Curry College alum, and sports a 45-40 career record in five years. Luvisi teamed with co-head coach Ann Thomae to lead Cohasset to a 19-3 record and the South Shore League title, as well as the Skippers’ first South Sectional title. A graduate of Millis High and Stonehill College, he also coaches boys’ golf. In her third year, Thomae and co-head coach Chris Luvisi combined to guide the Skippers to their most successful season, resulting in a Division 3 South Sectional title. A graduate of Boston College, she enjoys traveling, hiking, and reading. Bay State — Brookline: Josh Caplan, Alex Chin, Alexander Johnson, Jesse Lamba, Theo Tamayo. Framingham: Drew Coleman. Needham: Alex Cohen, Sam Cohen. Newton North: Adam Goffstein, Owen Grafe, Alex Leighton, Kevin Salomon. Wellesley: Alex Chapman, Ethan Chapman, Dan Foley, Jack Mykrantz, Michael Pioso, Michael Rosen. Weymouth: Rohith Parvathaneni. Big Three — Brockton: Jermal Murray. Durfee: Jawanza Foster, Tom Martin, Brian McDonald, Nick Mello, James Souza. New Bedford: Damien Montague, Danny Nguyen. Cape Ann — Manchester Essex: Seth Cohen, Jeff Durkin, Justin Eichenberger, Michael Fuca, Jake Rich. Newburyport: Chris Kirkpatrick. North Reading: Kyle Harris. Pentucket: Adam Chory, Logan Sherwood. Triton: John DiDonato. Catholic Central — Arlington Catholic: Allen Judd, Chan No, Nick Papathanasiou, Statish Reginald. Austin Prep: Trevor Cox, Alexis Gilmore, Teddy Sackos, Stratton Stilianos, Luke Wyman. Bishop Fenwick: Zach Mutti. Cardinal Spellman: Chris Nealon. Lowell Catholic: Alec DiCiaccio, Adrian Lambert, Jun Sup Shin. St. Mary’s: Connor Foley, Matt McManus, Patrick Morin-Plante, Brady Ryan. Catholic Conference — BC High: Jeremy Mendoza, Charles Morris, Caye Tittmann, Bailey Ward. St. John’s Prep: Chase Davis, Alec McNiff. Xaverian: Jamie Chisholm. Dual County — Acton-Boxborough: Ray Bopanna, Eric Guba, Jeff Zhao. Concord-Carlisle: Max Bohn, Jeremy Silver, Andrew Vogel. Lincoln-Sudbury: Matt Organisak. Wayland: Jon Goodman, Ethan Hecker, Charlie Sharton, Will Sharton. Weston: Alec Been, Ethan Chen, Harry JePlow. Eastern Athletic — Bishop Feehan: Jack Lahiff, Hayden Miller, John Shanley. Bishop Stang: Lorenzo Dube, Lenny Murphy. Coyle & Cassidy: David Capella, Matthew Vaz. Somerset Berkley: Camden Iwanicki, Zac Pavao. EIL — Beaver Country Day: Gabe Belkind, Hunter Flint, Jesse Roberts. Concord Academy: Jackson Boyle, Dominik Buhl, Carter Jones. Pingree: Dan Peters, Jeremy Wiles. Portsmouth Abbey: Victor Florescu, Ryan Gallagher, Jack Guduoian, Stephan Navarro. Greater Boston — Cambridge: Cam Lindsay, Asim Ozvar, Dylan Vartikar, Eric White. Latin Academy: Aaron Goldsmith, Sam Pham. Malden: Alan La, Danny Yu. Somerville: Arpan Giri, Daman Li, Susant Porhket. Hockomock — Attleboro: Anil Mahesh. Foxborough: Kyle Pandiscio, Liam Reiss, Wes Young. King Philip: Kyle Caragliano, Tim Smith, Jason Trudeau. Mansfield: Jake Cavicchi, Matt Medeiros, John Menz, Eric Sun. North Attleborough: Kumail Alikhan, Anthony Rinaldi. Oliver Ames: Thomas O’Leary. Sharon: Peter Hu, Charlie Powell. ISL — Belmont Hill: Jack Ablon, Ben Lebowitz. Groton: MacGregor Beatty. Milton Academy: Chris McDonough, Bart Panarese. Nobles: Will Samuels. Roxbury Latin: Joey Haig, Christian O’Connor, Andrew Wang. St. George’s: Harry Shepherd. St. Paul’s: George Congdon. St. Sebastian’s: Weston Brach. Mayflower — Bishop Connolly: Shawn Fay, Tony Nguyen, Viet Pham. Sacred Heart: Cameron Keough. West Bridgewater: Connor Cullinane. Westport: Rich Hartnett, George Machairas, Scott Raudonaitis, Nick Rosa, Lyle Ross. Merrimack Valley — Merrimack Valley -- Andover: Andrew Imrie, Varun Penamatsa, Drew Rooks, Aaron Edelmenj, Arun Padykula. Methuen: Luis Martinez. North Andover: Kyle White. Middlesex (Freedom) — Burlington: Scott Barrett, Nick Fahey, Yash Kamani, Billy Parrott, Nick Roberto, Nikhil Thakkar, Lawrence Yu. Melrose: Liam Brown, Joe Hughes, Julian Nyland. Wakefield: Dylan Sellers. Wilmington: Mike Diorio, Chris Saporito, Justin Wright. Middlesex (Liberty) — Belmont: Matt Lewis. Lexington: Connor Chin, Gideon Feifke, David Herrera, Ben Maffa, Harry Nichols, Daniel Seong. Reading: Jackson Conroy, Andrew Sullivan, Alec Tzianabos. Winchester: Sam Criss, Cole Gladstone, Yinian Tang, Anthony Trasatti. Northeastern — Beverly: Peter Coletti. Danvers: Nick Lisichenok, Toma Nabokin. Marblehead: Miles Barry, Griffin Butterfield, Justin Faia, Michael Forte, Jason Frost, Chris Wigglesworth. Old Colony — Barnstable: Sonny Bisazza, Colby Blaze, Cooper Blaze, Max Francis, Cooper Hesse. Bridgewater-Raynham: Andrew Do, Kyle Rego. Dartmouth: Lucas Almeida, Colin Burke, Christian Machado, Chris Ouelette. Patriot — Duxbury: Mike Melampy. Randolph: Sebastien Barthole, Joshua Huang, Anthony Yuan. South Coast — Martha’s Vineyard: Dunovan Belisle, Zak Danz, Conner Downing, Patrick McCarthy. South Shore — Cohasset: Nathan Bumstead, Jackson Dutton, Doug Fitzgerald, Mile Morin, Dan Surkovic, Eric Weinstein. Norwell: Liam Beal, Andrew Cibotti, Jake Duckworth, Will McDonald, Sam Rinko, Cam Roach. Rockland: Owen Mahoney. Tri-Valley — Ashland: Max Freeman, Miles Klapow. Dover-Sherborn: Alex Adamczyk, Dylan Baroody, Emilio Ftypoulos, Priyan Thurairatnam. Holliston: Mitchell Coburn, Jordan Paecht, Jack Sykes. Hopkinton: Katie Schneider. Medfield: Joe Arthur, Scott Braverman, Max Karger, Max Senkovsky, Ryan Woods. Westwood: Will Delfeld, Steve Lannum.